Ritz 1035 was acquired by The Mean Fiddler Group on 24th May 2002, who then sold it onto Sunrise Radio. They re-launched it, but then switched to an Asian format, bringing the curtain down on Country Radio in London. Following some changes at Ritz at the beginning of 2002, I had a few months on the evening show, which was fun. I spent the week of 15th April on the Afternoon, show to take me to the end of my current contract. This followed my shows over the 2001Holiday Season, notably lots of shows over Christmas 2001, and throughout January 2002. I began producing programmes and features, and presenting programmes for the UK's only terrestrial 24-hr Country Music radio station Country 1035 (London), in November 1998. It followed spells on Century 106 (East Midlands) and Wave 105 (South Coast), where my "Red Hot & Country" shows were successful and very popular with the listeners. During my 28 months with the London-based station, I saw many changes. There were several comings and goings and a change of name to Ritz 1035. Nothing lasts forever, and come the end of February 2001, it was time to part company. Or was it ??? In late August 2001, Ritz parted company with Managing Director Howard Bowles, and no sooner had he departed, I was called to return. 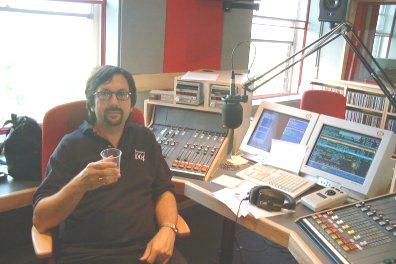 I actually presented the afternoon show on 15th Sept, shortly after returning from my holiday. Indeed, I have been pleased to fulfil freelance activities, when called upon. I looked after the "Number Ones" show on Fri. 19th October, and spent the night of Wed. 7th November 2001, producing their coverage of the 35th CMA Awards for the Dave Cash Breakfast Show. Further engagements saw me hosting the weekday evening show for a fortnight, commencing Mon. 19th Nov 2001, and "The Hall of Fame" on Sun. 25th Nov (see my Playlist). And, as you can see, I got back in the saddle just before Christmas 2001. In May 2000 Ritz 1035, underwent a 'makeover', and we moved into the new studio complex on 24th August 2000, on the 4th floor of the RMG building in Wembley, opposite the Arena and the Stadium. Here I am getting comfortable behind the new desk in Studio One. I had been filling-in on the Breakfast show, prior to the new schedule, and became actively involved behind the scenes. In June 2000, I anchored their broadcasts from Fan Fair in Nashville, with David Allan reporting in, each morning. I also covered his Sunday shows on 11th & 18th June. I sat in on the evening slot (9pm to midnight) for the week of 8th May. From 28th May 2000 until 25th Feb 2001, I presented the Sunday evening show, and I, once again helped anchor Ritz 1035's coverage of the C.M.A. Awards, on 6th October 2000, as I had in 1999. I continued studio-producing the excellent Captain America programme, for a couple of weeks after I "left" Ritz, though my final show with Nick Stewart was on Thur 16th March. He gave me the most fantastic send-off, and the phone lines were jammed with well-wishers. I thought this was it, but on 3rd May 2001, I received a call inviting me back to continue my relationship with Nick Stewart and The Captain America programme. I have to say that working on that programme was some of the best fun I have enjoyed in this business. His programme on 6th October came live from Nashville, where he was joined by guests Kurt Wagner & Jonathan Marks (of Lambchop), Gregg Trooper, and veteran songwriter Bob Montgomery. The Captain America Show review of 2000, was broadcast on Thu. 21st Dec. He was joined by Nigel Williamson of 'Uncut' magazine, and they ran down the Top 25 albums of the Year. By contrast, the following week was an all-oldies edition, and was terrific. Sadly, following management changes there, the Captain America show came to an end on 31st Aug. 2001. The Captain America Radio show switched to Virgin Radio at the beginning of January 2002. Sunday nights at 10pm. Once again, I had the opportunity to play some of my vast collection of Christmas records, on Ritz 1035, over Christmas 2000. I presented the Christmas Eve Party, from 7pm to Midnight, and after grabbing a couple of hours sleep, I was back live on air, for the Christmas Day Breakfast Show, at 6am, with a very special guest: the 12-year old sensation, Billy Gilman. We played some tracks from his "Christmas Classics" album (Columbia import). I was back in the saddle for the Boxing Day Breakfast Show and the Boxing Day Afternoon Show. Unexpectedly, I found myself looking after a number of extra shows during that week, including the Drive Show (3pm to 7pm) on Fri. 29th, and the New Years Eve Breakfast Show. Later that evening, I was back in the studio, to be live on Ritz 1035 on New Years Eve to party into 2001, from 7pm. Since the beginning of 2001, I found myself covering a number of shows on the station, including the Sunday Breakfast and the occasional weekday 7pm to 9pm slot. The early part of 2001 saw Ritz 1035 maintaining its policy of having live acoustic music on the station, with a succession of some excellent guests. My great friend Dennis Locorriere came in on 23rd Jan. Suzzy Roche and her sister Maggie were also welcome visitors, a couple of days later, ahead of their London show.